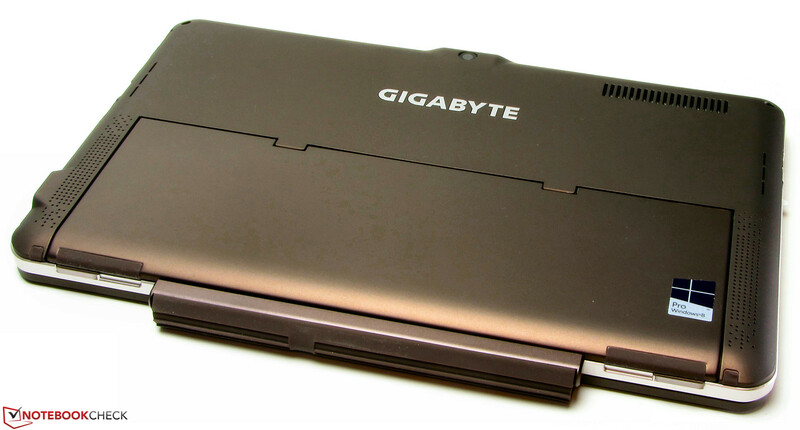 Gigabyte does not call its S1185 a tablet, but gives the device the name Padbook. 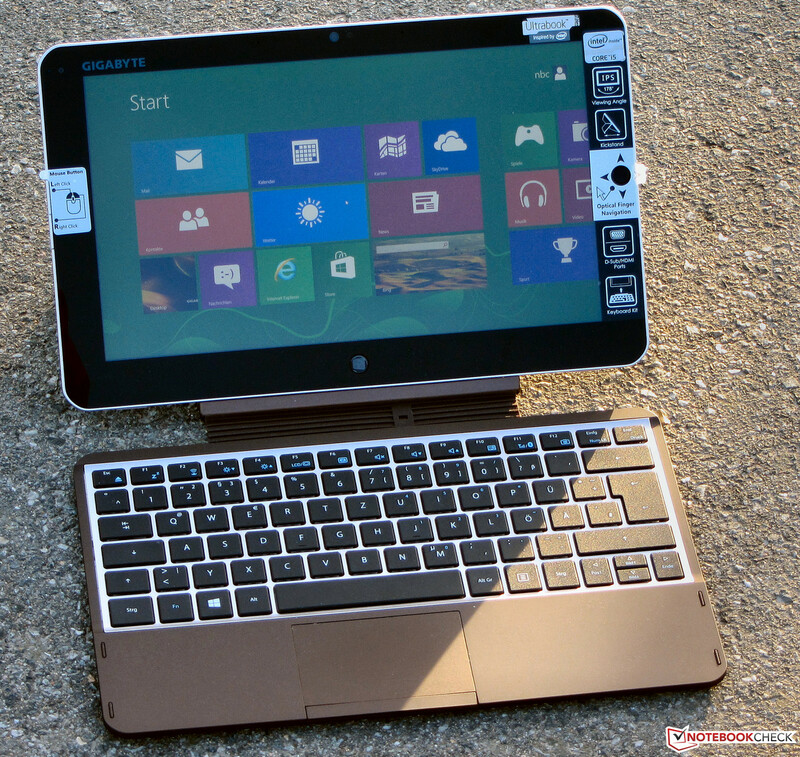 It is a convertible, a combination of a tablet and a subnotebook. A powerful processor, a fast Solid State Disk and comparatively extensive port equipment for a tablet lay the foundations for a successful device. We checked if that is the case. We consider the Wortmann Terra Mobile Pad 1160 Pro (Core i5-3337U, HD Graphics 4000) and Microsoft's Surface Pro (Core i5-3317U, HD Graphics 4000) as the main competitors. Hands-free operation thanks to the kickstand. 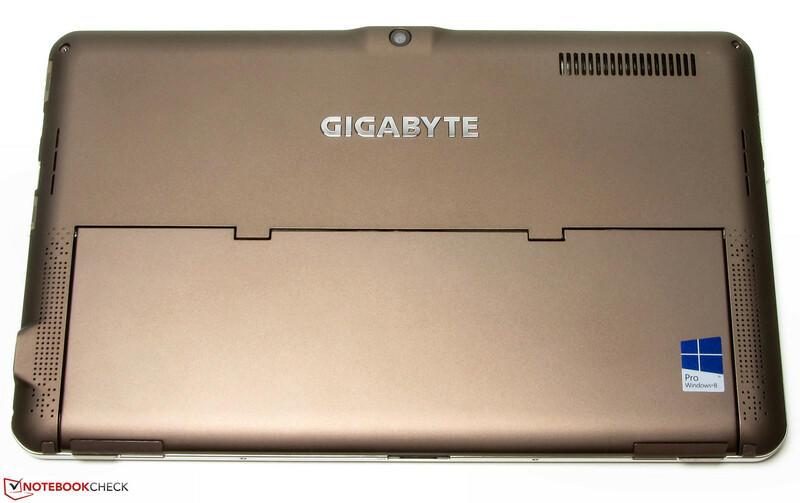 Similar to the Wortmann Terra Mobile Pad, Gigabyte uses a plastic case while Microsoft equips its Surface Pro with a magnesium alloy. 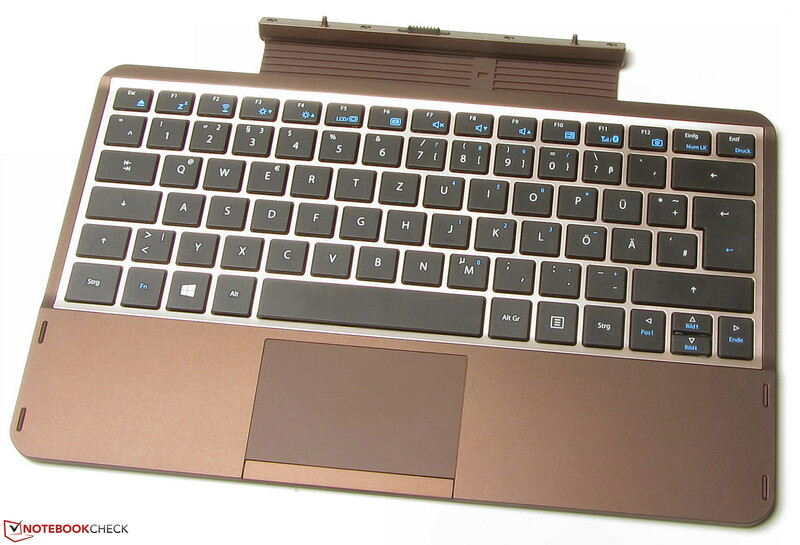 The back of the S1185 as well as the keyboard are brown and the tablet is surrounded by a silver plastic frame. The S1185 is also equipped with a kickstand, just like the Surface Pro; it enables hands-free operation of the device. 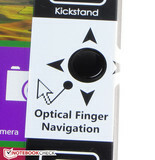 However, the kickstand only supports one position, you cannot choose between multiple angles. The stability of the case could be better since we were able to twist the device but the build quality is otherwise convincing. With a weight of 1 kg and 1.4 kg (with attached keyboard), (~2.2 and 3.1 pounds respectively), our S1185 is on the same level as its rivals. Attaching the keyboard is very easy and you cannot really make any mistakes. The magnets will do the rest for you as soon as the tablet and the keyboard are close together. You can also use the attached keyboard as a protective cover for the display and close the device just like a typical notebook. A magnet keeps the keyboard in position when the device is closed. Within our three mentioned devices, the S1185 has the most comprehensive port variety. Besides two USB ports, you can attach external displays via HDMI and VGA. 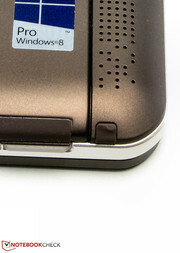 All ports of the S1185 are located at the left or right side of the case; the ports are not too far inside the case and not too close to each other, either. Even bulkier peripherals should not be a problem. One thing that should be pointed out is that all the ports are located on the tablet, so cables will hang from the sides when you use the kickstand. This could be a problem, especially with thicker and heavier HDMI cables since the port would be at the upper right side in this scenario. 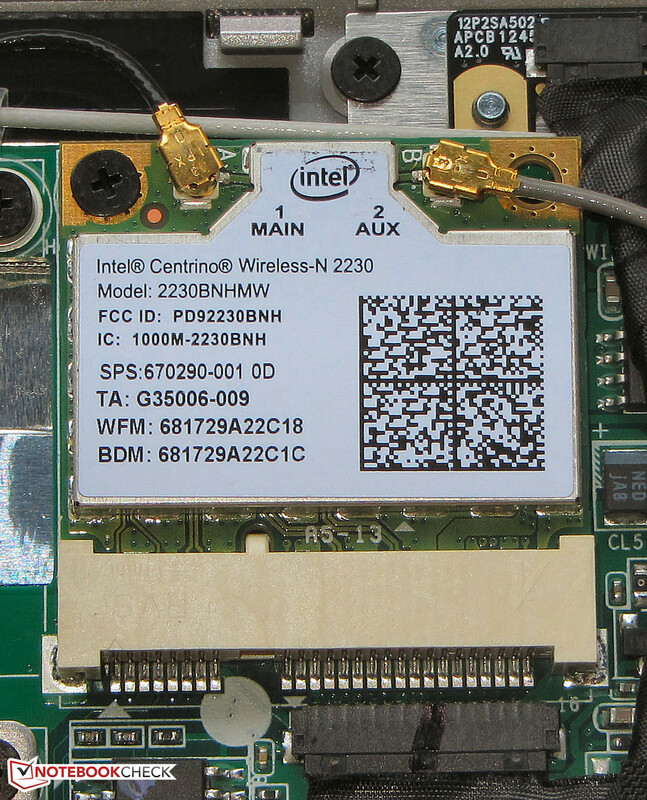 Gigabyte equips the S1185 with an Intel WLAN module (Centrino Wireless-N 2230), which also supports Bluetooth 4.0. A quick performance check with Windows shows full bars in all situations, it does not matter if the tablet is close to the router (around 3 meters/~10 feet) or on another floor. 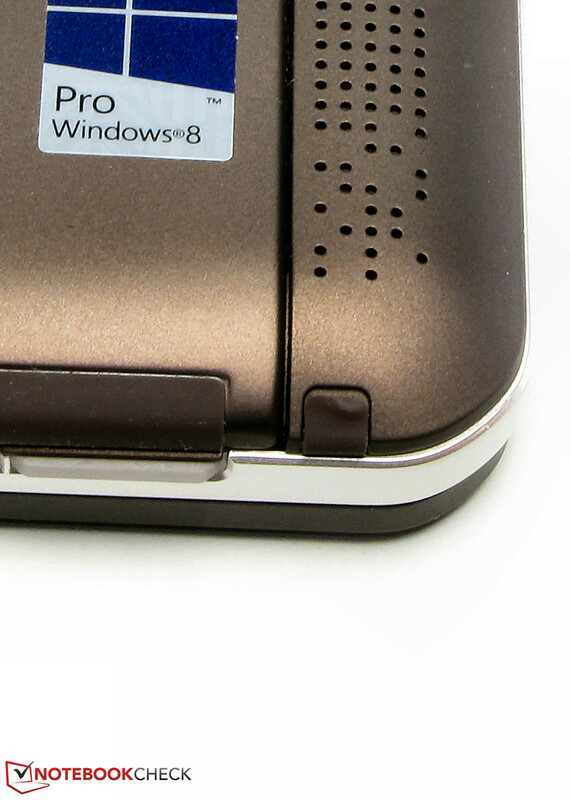 The S1185 also has a SIM card slot, so you can use the Internet on the road. Besides the SIM card there is a slot for a 3G/3.5G modem (UMTS-ready), you will only have to upgrade a fitting module. According to the FAQs on Gigabyte's website, the Huawei EM820W modem is the only module that works with the S1185. The necessary drivers can also be downloaded on Gigabyte's website. At the time of this review we found the module for 80-90 Euros (~$108-$121) on the Internet. More specifically, the website only says that the mentioned Huawei modem is the only 3.5G modem, which can be used. This does however not mean that other 3G modems will not work. We installed an old HSPDA modem from Dell (Wireless 5505; retail price 5 Euros/~$7) and the needed driver is available on Dell's website. The module was recognized and we could use it without problems. Other modules might also work but you have to try it. 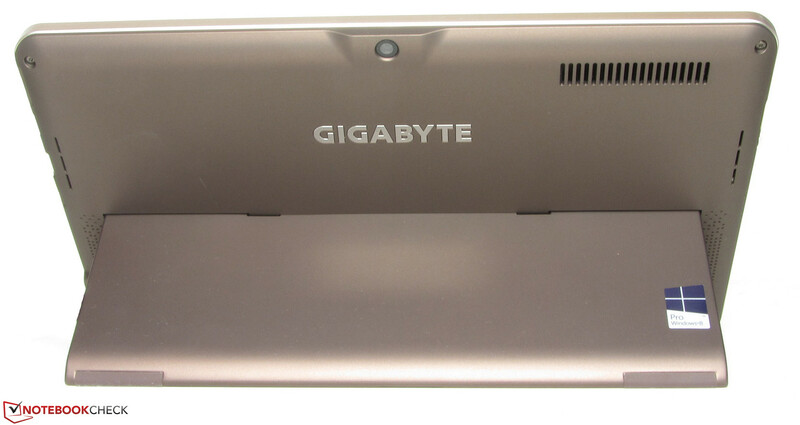 The Gigabyte tablet has two camera modules: The main camera at the back with a 5 MP sensor and the front camera with a resolution of 1.3 MP, at least according to the specs. 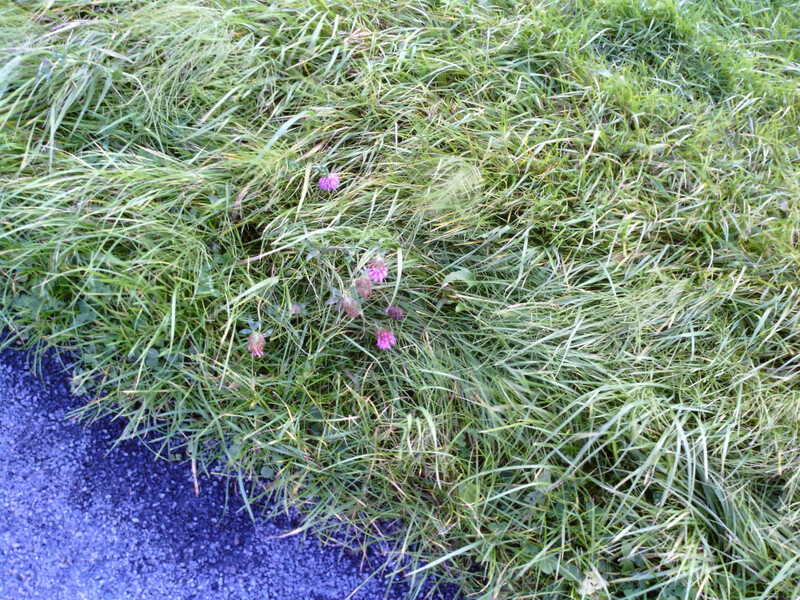 The camera app of Windows only shows a maximum resolution of 0.9 MP. 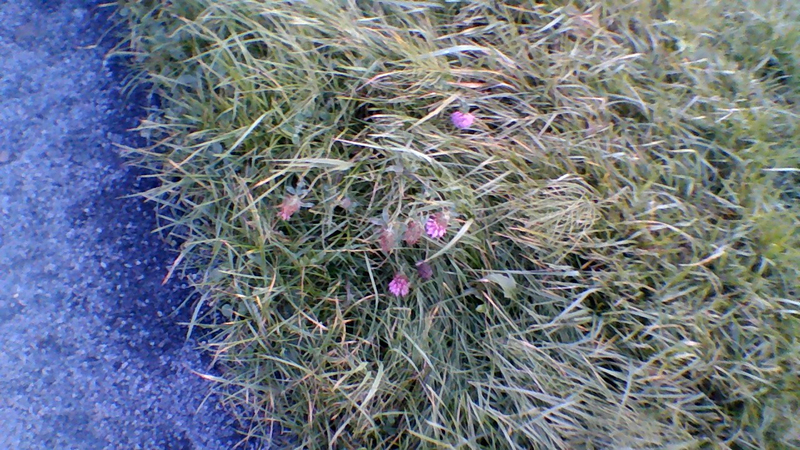 The results are very blurry pictures. Even the main camera should only be used for occasional snapshots. Gigabyte does not follow the common trend to minimize the accessories and includes a protective bag for the S1185 besides the usual documents (manual, warranty information). 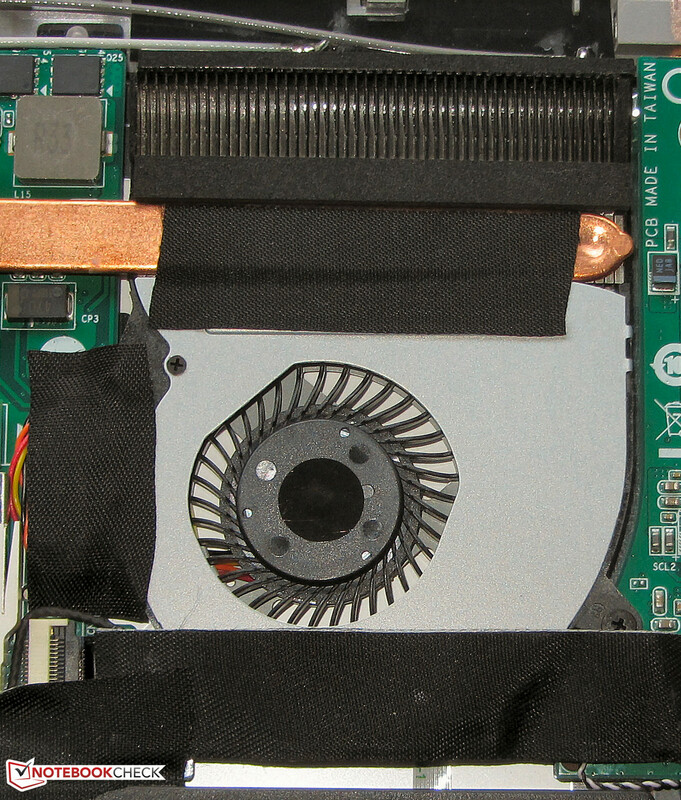 There is also a driver DVD as well as an OEM version of PowerDVD 10. 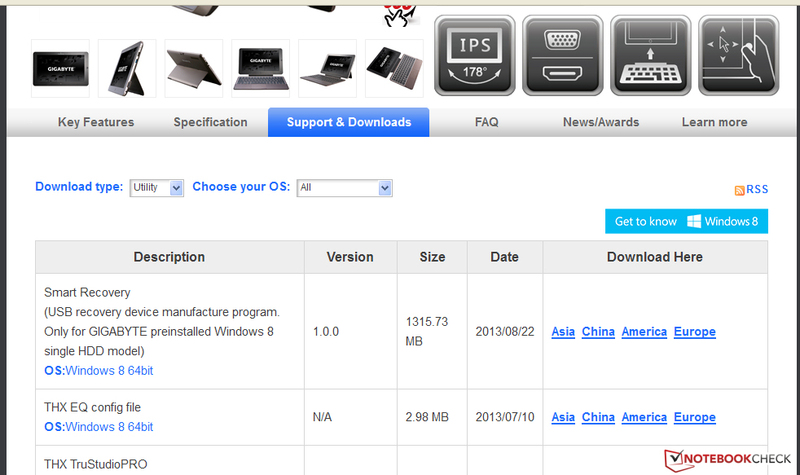 The S1185 is delivered with a preinstalled version of Windows 8 Pro (64-bit), but there is no additional Windows DVD. You can start the Windows recovery system via the F9 key or the volume down button on the tablet during start-up. 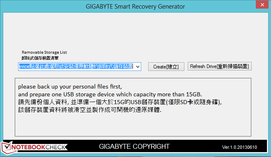 You can download the Smart Recovery Generator (file size: 1.3 GB) in the download area on Gigabyte’s website. It can use a USB drive (at least 16 GB storage) as a recovery drive. We highly recommend this method when you purchase the tablet to be prepared for the worst case. 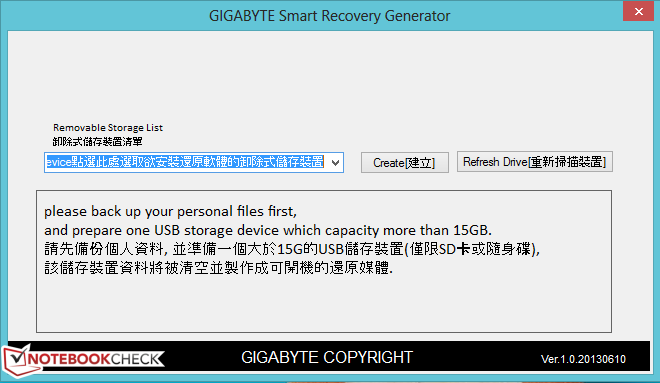 The Gigabyte Smart Recovery Generator. You can download the tool on the website. It is possible to maintain the tablet. 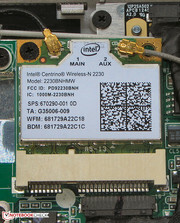 To access the components you have to remove the back of the tablet, which is not a big problem. Just loosen five Torx screws and carefully remove the cover with a sharp object. 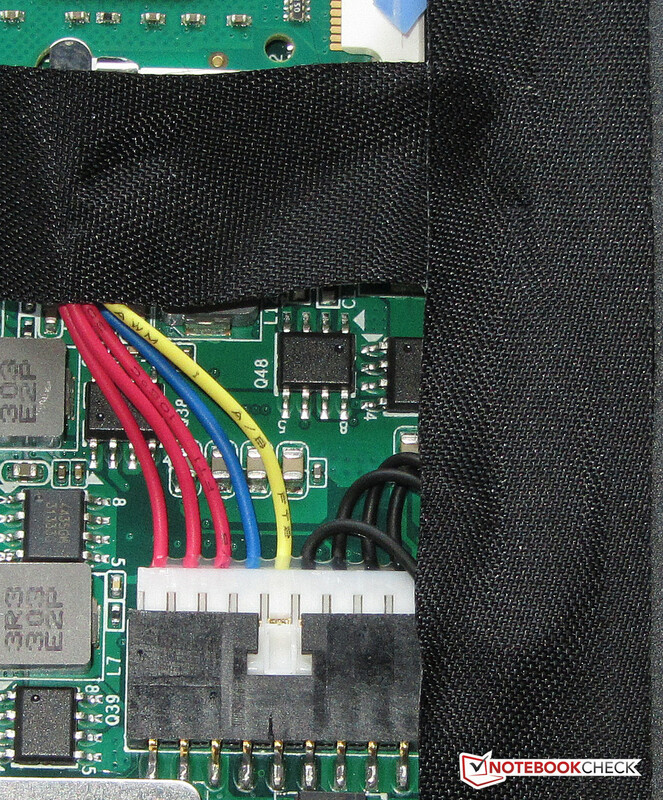 After that, you gain access to the memory, SSD, WLAN module, fan, BIOS battery, UMTS slot as well as the battery. 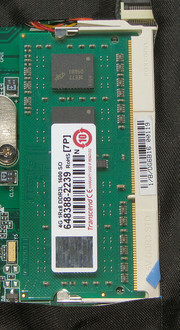 The tablet has one memory slot, which is equipped with a common DDR3L module (4 GB) ex-works. According to Gigabyte, the maximum amount of memory is 8 GB. Gigabyte decided to integrate an mSATA Solid State Disk; the module in our review unit is only half-sized. 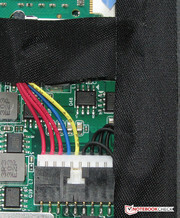 However, you can also integrate full-sized mSATA drives. 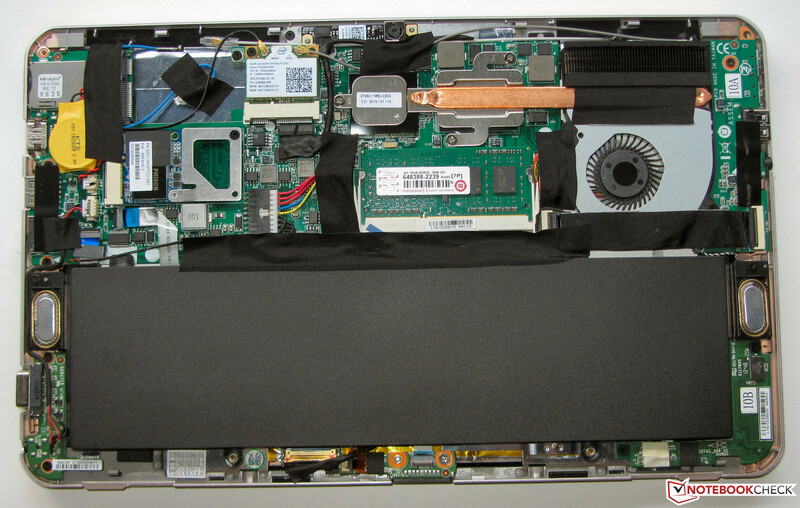 The removal of the fan is possible if you want to clean it and even the BIOS battery and the tablet battery can be replaced. The standard warranty period for the S1185 is 24 months, which is identical to the Surface Pro and the Terra Mobile Pad. We could not find any warranty extensions for the S1185. 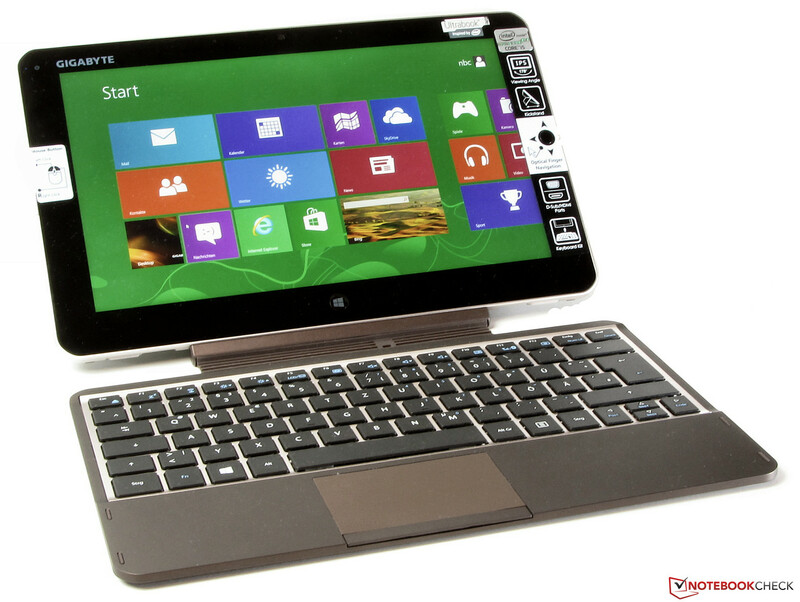 The scope of delivery includes an attachable chiclet keyboard, which is an advantage over the Surface Pro. The standard keys are 15 x 15 mm; the flat and slightly roughened keys have limited travel and a good feedback, even though it could be firmer. We could determine some bouncing during typing, especially in the center of the keyboard. 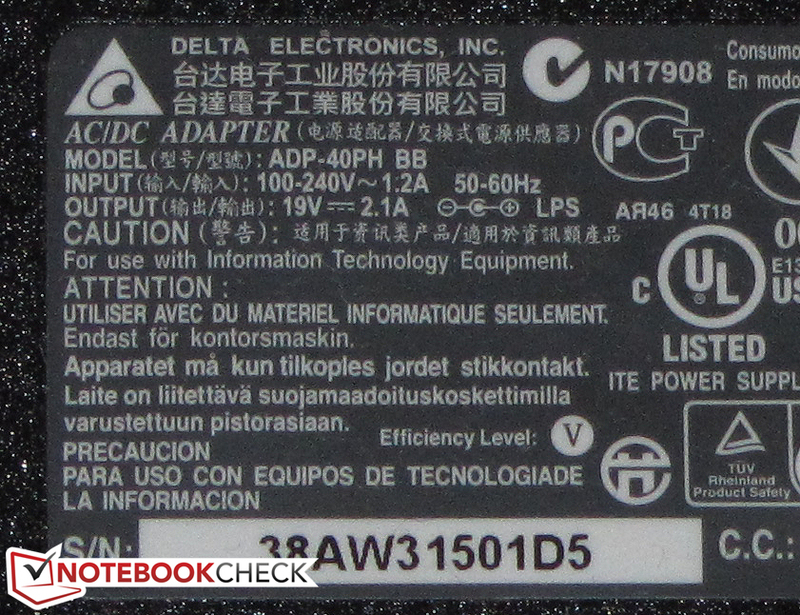 Still, the overall quality of the input device is acceptable, even though it can obviously not compete with very good notebook keyboards, which can be found in the Lenovo ThinkPad Edge E145, for instance. 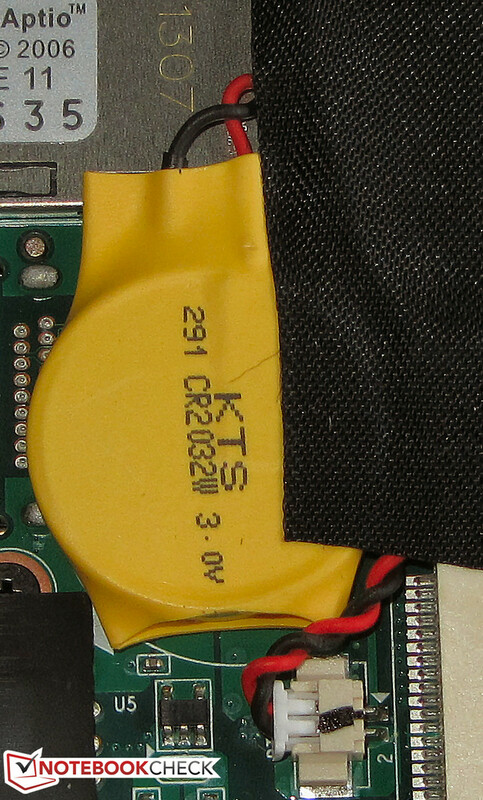 A small touchpad (8.2 x 5.1 cm/~3.2 x 2.0 inches) is below the keyboard. Its smooth surface provides excellent gliding capabilities. 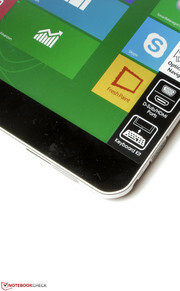 The touchpad also supports multi-touch gestures, which can be configured individually in the settings. 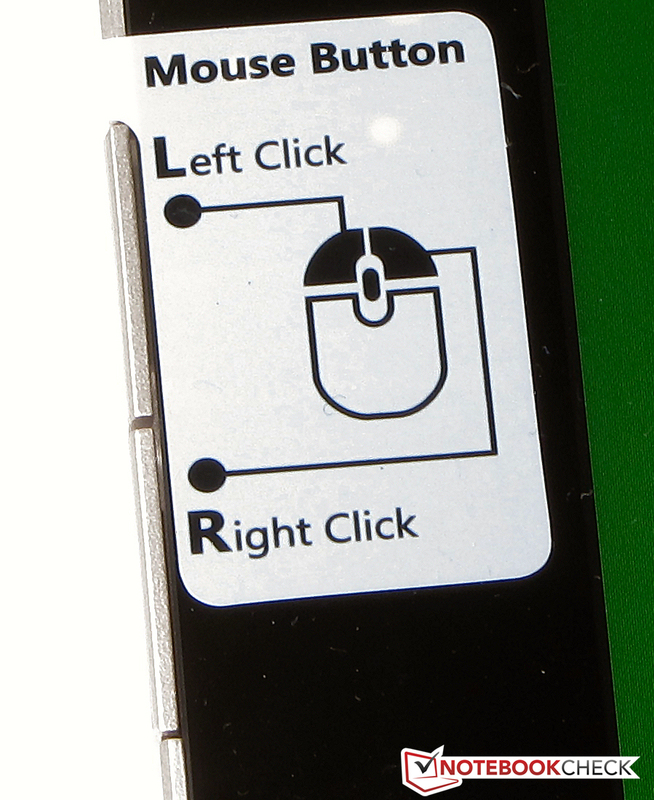 The two mouse buttons have a short travel and a clearly perceptible and audible pressure point. 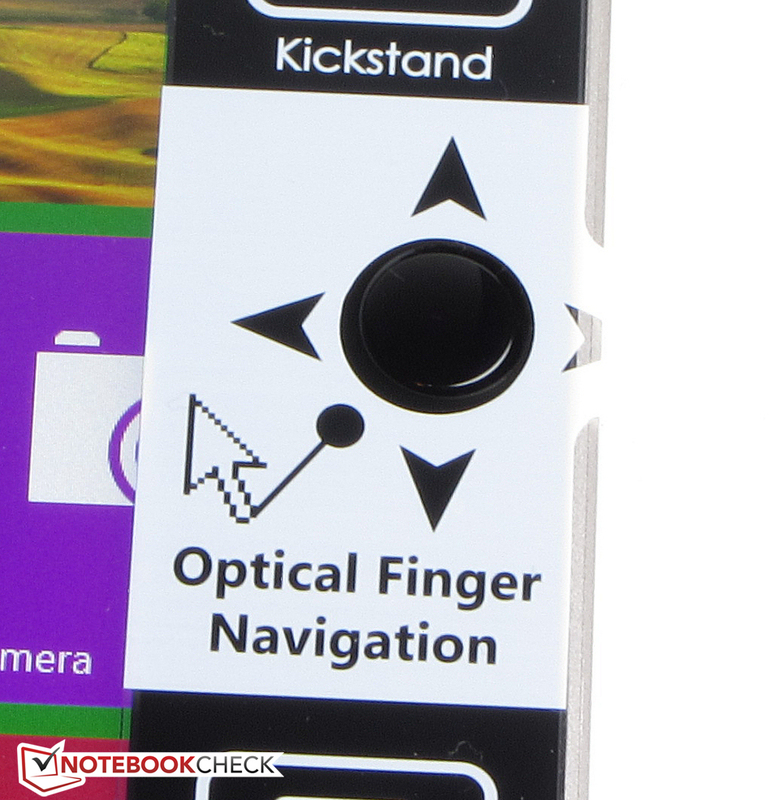 Besides the touchpad, there is another input device for the cursor directly on the tablet: Next to the right display edge is an optical sensor that recognizes movements of your finger, the cursor moves according to the movement of the finger. This works really well and the sensor is also a mechanical button at the same time that can be used as the left mouse button. On the opposite side of the tablet are two additional mechanical buttons that represent the left and right mouse button, respectively. This additional input device is very sophisticated; you can hold the tablet with two hands and operate it with the thumbs at the same time. However, you will have to get used to the location of the two mechanical buttons. You usually grab the tablet at this position so unwanted mouse clicks can be a problem. We cannot find any points of criticism in regard to the touchscreen: Gigabyte uses a capacitive touch panel that executes inputs without delays. A button at the left side of the tablet locks the display orientation. ...as well as two separate mouse buttons. 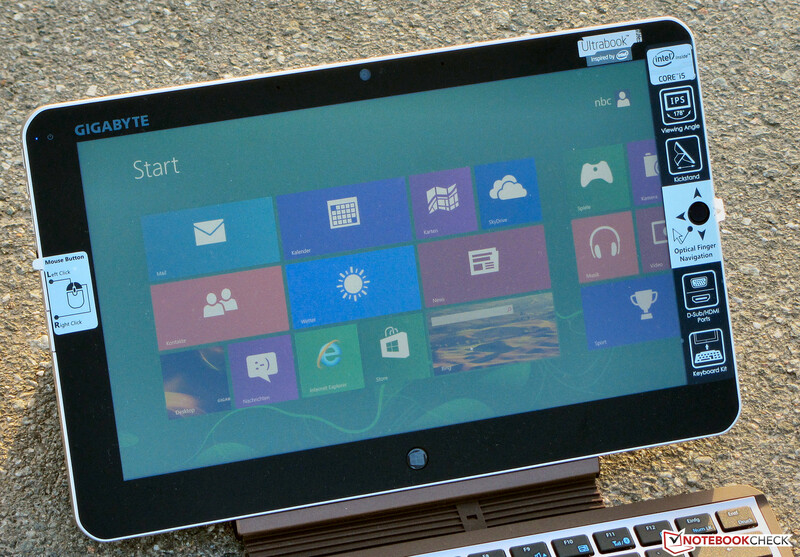 Gigabyte equips the S1185 with a glossy 11.6-inch display and a native resolution of 1920x1080 pixels. Other display versions are not available. Similar to the Surface Pro, the S1185 also uses an IPS panel. An average brightness of 288.1 cd/m² is a good result but cannot keep up with the excellent values of the Surface Pro (355.9 cd/m²). The Terra Mobile Pad on the other hand is clearly behind the competition with 254.2 cd/m². The results for the contrast ratio (975:1) and black value (0.317 cd/m²) are very good and the S1185 can even surpass the Surface Pro (742:1 and 0.5 cd/m²) and the Terra Mobile Pad (755:1 and 0.38 cd/m²). 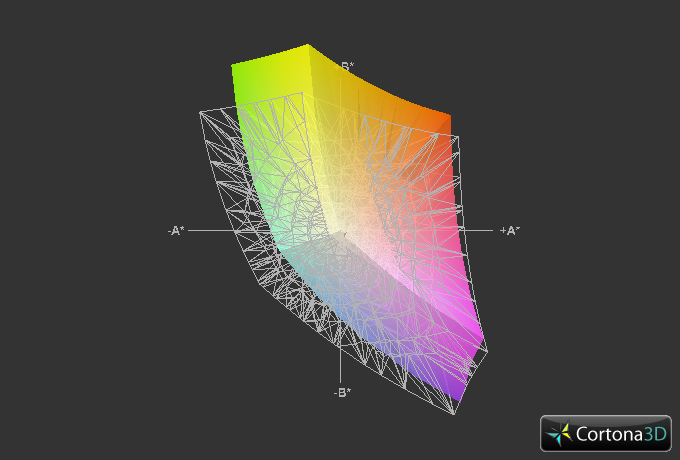 Our review unit cannot cover the AdobeRGB or sRGB color spaces; the sRGB coverage is just shy of 75%. However, these values are mainly important for professional picture editing. The color accuracy of the display is decent: The average DeltaE-2000 deviation is just 3.82. Almost all colors are within the target area (DeltaE less than 5). This value is only exceeded by three warm colors but we could not determine a blue cast from the display. You can actually use the tablet outdoors – contrast and display brightness are sufficient for that. You should however avoid reflections, for instance under direct sunlight. Otherwise, you will not recognize very much on the display. The viewing angle stability is excellent, just as we expected from the IPS display. You can see the display content from every position. 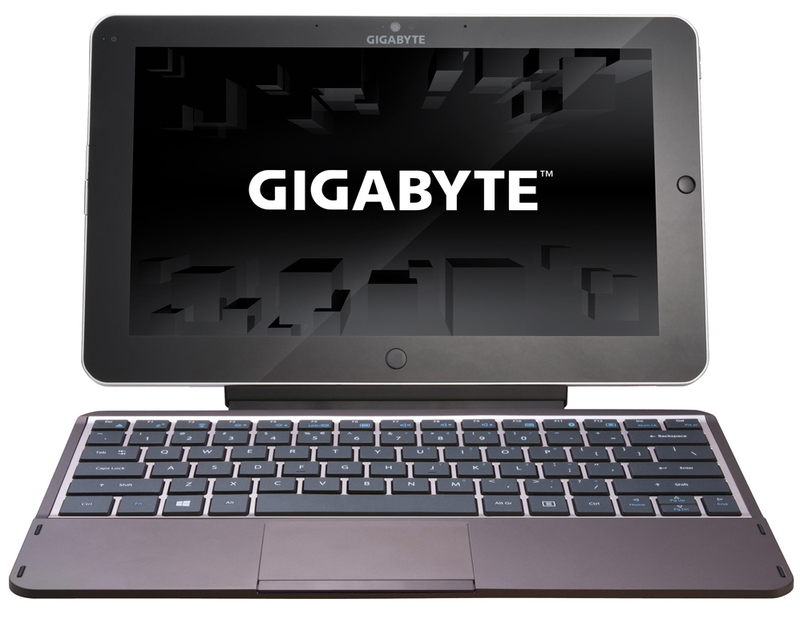 Gigabyte offers a tablet that can also be used for working on the road. 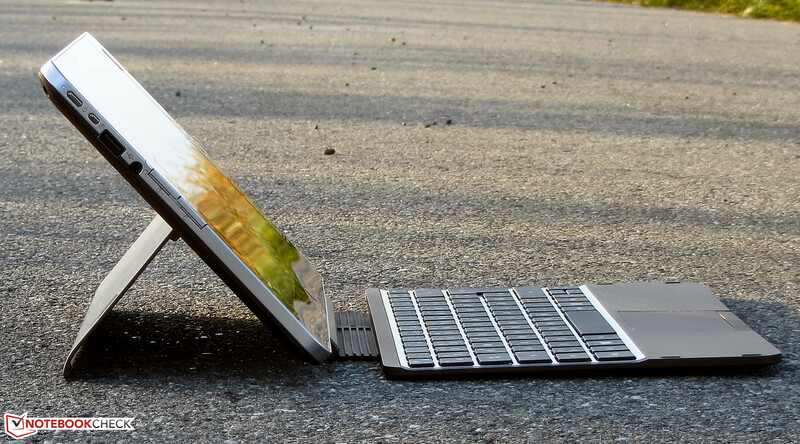 You can equip the S1185 with a 3G module and comfortable typing is no problem thanks to the attachable keyboard. The Core i5 processor in combination with the fast SSD provides a high system performance that is sufficient for most usage scenarios. Our review unit is currently available for 999 Euros (~$1347), but you can also get the Padbook for 789 Euros (~$1064) if you are satisfied with a Pentium 2117U, a smaller SSD (64 GB) and the standard version of Windows 8. The heart of the S1185 is a Core i5-3337U. The dual-core CPU is based on the Ivy Bridge architecture and has a nominal clock of 1.8 GHz. The clock can be raised to 2.5 GHz (both cores) and 2.7 GHz (one core), respectively, via Turbo Boost. The processor runs with 2.5 GHz in the Single-Thread tests of Cinebench, we can only see the maximum 2.7 GHz for short periods. 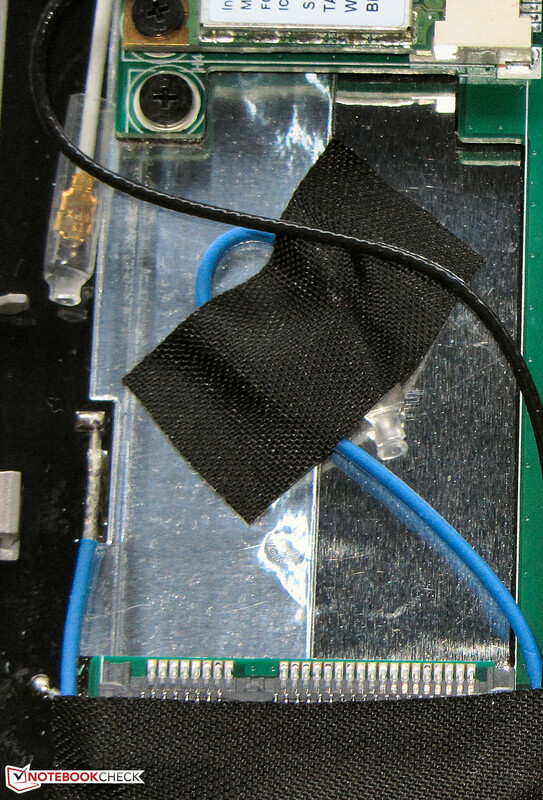 We also determined a clock of 2.5 GHz for the Multithread tests; the results are therefore on an expected level. The results of the Terra Mobile Pad (Core i5-3337U, HD Graphics 4000) are virtually identical because of the same processor. Microsoft’s Surface Pro (Core i5-3317U, HD Graphics 4000) on the other hand is slightly slower because of the lower clocked CPU. Even though all three devices use the same GPU we can see higher results from the Surface Pro in the GL benchmarks. We can quickly see the reason for this: Only Microsoft’s tablet has a dual-channel memory configuration, which improves the graphics performance. Operating the system is fast and smooth; we can clearly see the impact of the fast Solid State Drive. 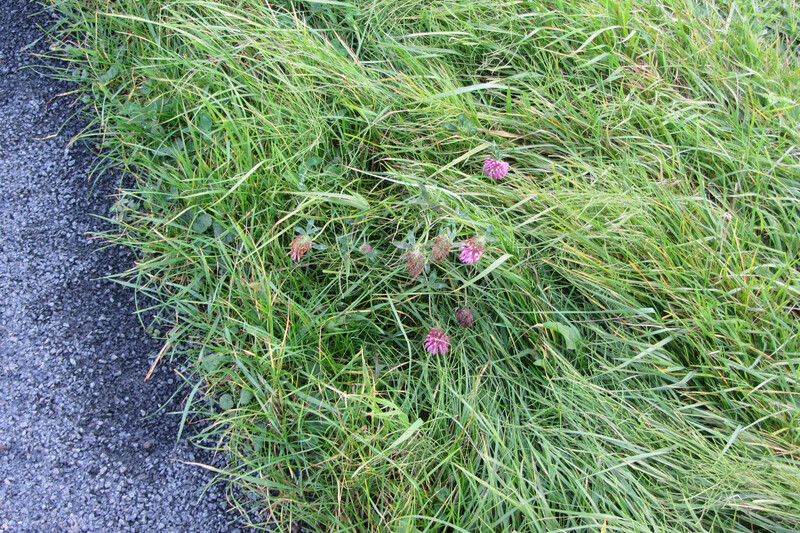 The excellent PCMark results confirm this impression. The Terra Mobile Pad (Core i5-3337U, HD Graphics 4000) has a slower SSD and is slightly behind the S1185 while the Surface Pro (Core i5-3317U, HD Graphics 4000) is once again superior because of the dual-channel memory. 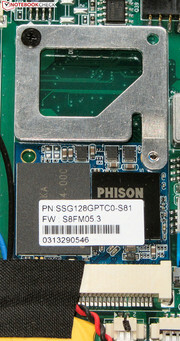 Gigabyte uses a 128 GB mSATA Solid State Drive (half size) from Phison. The SSD provides fast read performance but cannot keep up with the latest SSDs in terms of write performance. Graphics are handled by the HD Graphics 4000 GPU. It supports DirectX 11 and has a clock between 350 and 1,100 MHz. 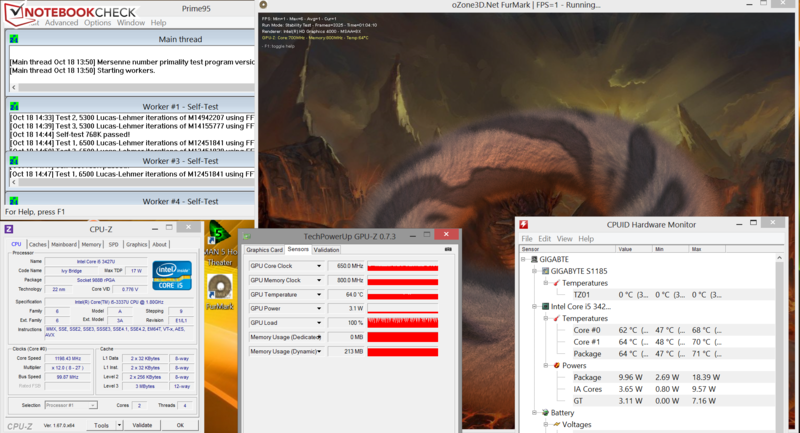 The 3DMark results are worse than this CPU/GPU combination would suggest. Our stress test shows that neither the processor nor the graphics card can maintain their full performance under load. The Surface Pro (Core i5-3317U, HD Graphics 4000) and the Terra Mobile Pad (Core i5-3337U, HD Graphics 4000) get higher scores. Microsoft’s tablet once again benefits from the dual-channel memory configuration. The hardware equipment of the Padbook is powerful enough to play some games with low resolutions and reduced details. An older game like Trackmania Nations Forever can even be played with high details. Games that were specifically developed for Windows tablets are no problem at all. We can measure a system noise of 31.2 up to 31.8 dB(A) for the S1185 during idle, which is very similar to the Terra Mobile Pad (31.5 up to 32.2 dB(A)). 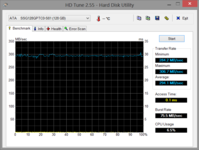 Both devices can however not keep up with the Surface Pro (29.5 dB(A)). Medium workloads and maximum load (stress test, Prime 95 and FurMark simultaneously) result in 37.1 and 37.3 dB(A), respectively. 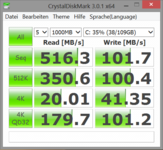 These results are better than the Surface Pro (38.2 and 40.9 dB(A)) and the Wortmann tablet (39.8 and 41 dB(A)). Temperatures during idle are no problem for any of the three tablets, with the lowest results for the Terra Mobile Pad. The temperatures of the S1185 are higher under load but not critical by any means. We could only measure temperatures around 40 degrees Celsius (104 Fahrenheit) in the area of the fan exhaust. The situation is very similar for the Surface Pro while Wortmann’s tablet even reaches more than 50 degrees Celsius (122 Fahrenheit) at one spot. We can only see the maximum CPU and GPU performance for one minute during our stress test (Prime95 and FurMark simultaneously) before the clocks are reduced to 1.2 GHz for the processor and 650-750 MHz for the GPU, respectively – with attached PSU and on battery power. Another 3DMark run immediately after our stress test was identical to the earlier result. The CPU temperature leveled off at around 64 degrees Celsius (147.2 Fahrenheit) with the attached PSU. (±) The maximum temperature on the upper side is 41.5 °C / 107 F, compared to the average of 35.4 °C / 96 F, ranging from 21.8 to 55.7 °C for the class Convertible. The stereo speakers of the S1185 are on both sides at the back of the tablet. They produce a rich sound but lack bass; voices are easy to understand. We recommend external speakers or headphones for a better sound experience. 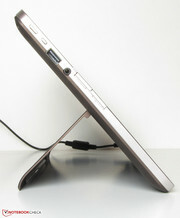 The Padbook consumes up to 12.8 Watts during idle, which is again comparable to the Terra Mobile Pad. The Surface Pro is more frugal, not least because of the smaller screen. Medium load (3DMark 06) or maximum load (stress test, Prime95 and FurMark simultaneously) result in 29.2 and 25.3 Watts, respectively. The latter value is lower because the tablet throttles the CPU and GPU clock under maximum load. Both the Surface Pro (36.8 and 43.2 Watts) and the Wortmann tablet (34.6 and 32.9 Watts) need more energy. The S1185 only manages a battery runtime of 5:25 hours during idle, both the Surface Pro (6:56 hours) and especially the Terra Mobile Pad (11:42 hours) have more stamina. We check the idle runtimes with the Battery Eater Reader's Test; the display brightness is reduced to the minimum, all energy-saving features are active and the wireless modules are turned off. The minimum runtime under load is just 1 hour and 37 minutes, which is similar to the Surface Pro (1:33 hours). The Wortmann tablet is once again the winner with 2 hours and 51 minutes. Our WLAN-Test is finished after 3:19 hours, which is again inferior to the Microsoft tablet (4:45 hours) and the Terra Mobile Pad (8:44 hours). This test simulates web browsing with a script that refreshes websites every 40 seconds. The energy-saving profile is active and the display brightness is adjusted to around 150 cd/m². The biggest drawback of the device is the small battery and therefore the short runtimes. It is not surprising that the Terra Mobile Pad is the winner of the tests since it has the largest battery (Gigabyte: 39 Wh, Microsoft: 42 Wh, Wortmann: 73 Wh). 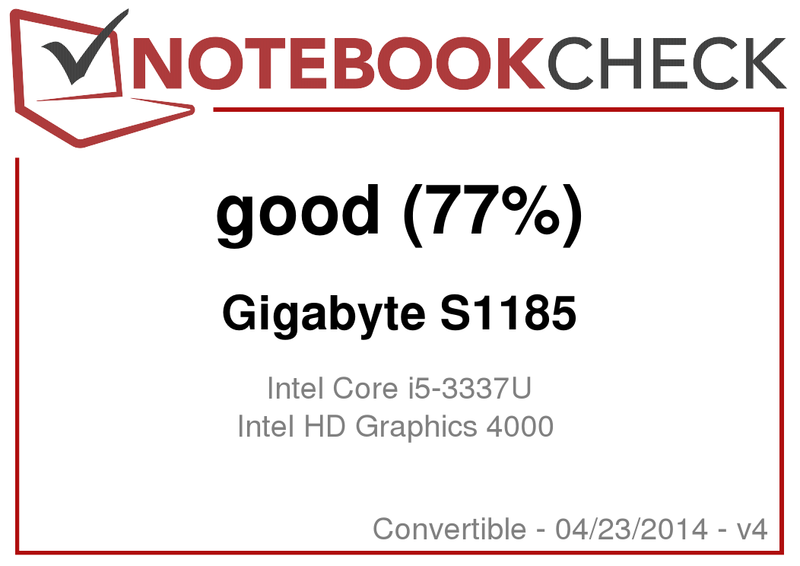 The Gigabyte S1185 knows how to please. It offers good system performance and has a great Full HD display (IPS). The attachable keyboard is also provided. If you need Internet on the road, you can install a 3G modem. We also liked the comparatively good maintainability of the tablet. You can replace, for instance, the SSD with a higher-capacity version. Gigabyte could offer a really good tablet if it was not for the poor battery runtimes. They are even shorter than many cheap notebooks because of the small battery capacity. This makes it quite hard to use the tablet on the road because you are constantly looking for a power socket. This problem could be easily solved with a larger battery and we hope Gigabyte will fix this when it comes to a potential successor. If you are looking for the best battery runtimes you should pick the Wortmann Terra Mobile Pad 1160 Pro. It also has a good keyboard and is equipped with a 3G module. Microsoft's Surface Pro is interesting if you are interested in a high-quality case. The tablet is also more compact than the rivals because of the smaller display. 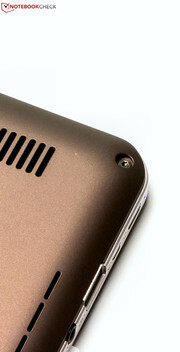 The S1185 has rounded corners. ...you can open the tablet. One memory slot is available. You can replace the bios battery. 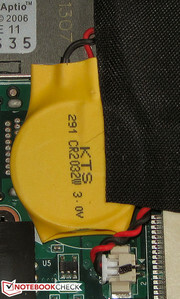 It is only attached with a small connector. 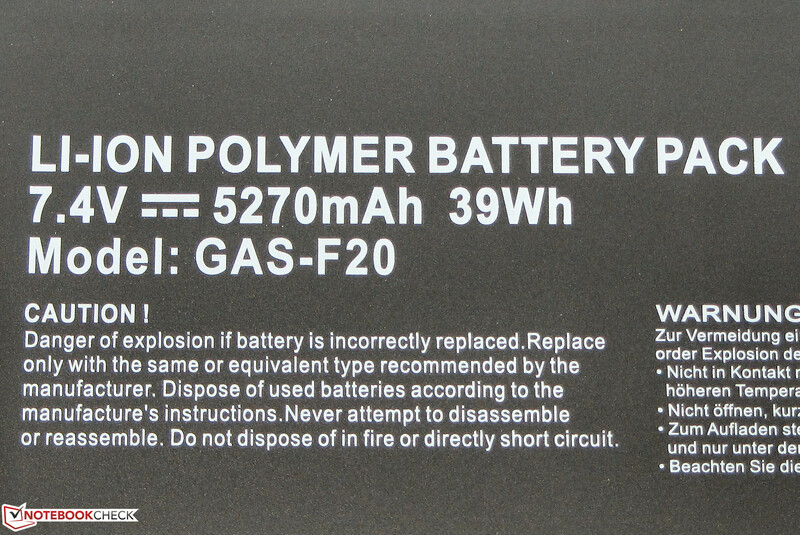 The battery has a capacity of 39 Wh. ...and has a rated output of 40 Watts. Two speakers at the back of the tablet. The great IPS display and the comparatively good maintainability. No doubt: Better battery runtimes. Gigabytes integrates a small battery that does not last a full day, even though the tablet is also intended for professional use.